Although it has only been two weeks since the conclusion of the 2017 Breeders' Cup Championship at Del Mar, work is already underway with regards to the 2018 event, which will be held at Churchill Downs for the first time since 2011. The Twin Spires Breeders' Cup Sprint (G1) purse will be increased to $2 million. Because what the Breeders' Cup was really missing was more horses emerging directly from maiden special weights. Never too early to crown someone a "champion". The press release just makes no sense to me. The official reasoning seemed to be that other races get over subscribed so it seemed like they cold attract a full field for this one. Which I'm sure is true but by the same token they could also easily fill a Nwx2 Alw at 1 1/16 on the main track if they put up a million bucks for it. Someone seems to have forgotten that these are meant to be "championship" events. They shouldn't be playing racing secretary and just writing races they think they can fill. Didn't the Juvenile Dirt Sprint prove to be a failure? Not sure how Juvenile Turf Sprint would be much better. Switch the Marathon to turf and increase the distance to 2 miles, that could be fun. We have seen some tremendous grass sprinters over the past few years (Black Caviar was kind of an international star ), and they've drawn quite a few fans. The BC may be trying to create a race that will draw the Lady Aurelia's of the future. Absolutely hate the idea of adding -yet another race- to the Breeder's Cup glut, but at least it's not the Breeders Cup Derby and then a Classic race in December.... yet. I understand the idea is to draw in more international players, but they already have the race for that? They haven't done a very good job drawing the best of the best in the Turf Sprint division in years past, so not sure how tossing a Juvie Turf Sprint race helps anything. How many 2YO aussies or HK based horses (where turf sprints seem to be king) will ship in for this? Hong Kong horses don't race until Summer of their 3 year old year. Their horses in training sales take place when the horses are 3, and their Derby/Triple Crown type series is limited to 4 year olds. So in the case of 'how many HK sprinters will this attract? None! The Breeders Cup board of directors is meeting today to discuss splitting the event. They are thinking of moving the Classic, the two dirt Juvenile races and one other unnamed race to 4-5 weeks after the original Breeders Cup and to Gulfstream Park. The above article pretty much says the board is currently split on whether it would be a good decision. But the ones that do not want to move the races, "fear antagonizing or alienating the supportive directors, which include Bobby Flay, the celebrity chef." This is beyond stupid. You can't fear doing your job. If you are on a board of directors, your job is to do what you feel is best not worry about what the other people on the board think. If Bobby Flay is that much of a baby that he can't take people disagreeing with him, then he shouldn't be on the board. They need to think about the HORSES here. Sure moving the Classic wouldn't effect much, besides fan attendance, because the average fan is not going to be able to afford to go to two different events a month apart. But moving the Juvenile races will result in the Derby/Oaks contenders not starting in the BC, or the horses not getting a winter break(which means they will need a break during the big summer races), or the horses just get a really late start to their 3yo seasons(meaning maybe 1-2 preps). I just feel they keep watering down the Breeders Cup. They have already voted to add another race, the Juvenile Turf Sprint. Apparently they didn't learn from the Juvenile Dirt Sprint. Just when I think the BC couldn't come up with a stupider idea. . .first, you add so many niche races that the event becomes unmanageable, Then you "solve" the problem by essentially abandoning the "weekend of champions" concept. As well as making the entire experience even less affordable for the average fan. Here is a statement from Breeders’ Cup from its directors’ meeting today. Seems like the context of “bifurcation” should be explained a little bit more. 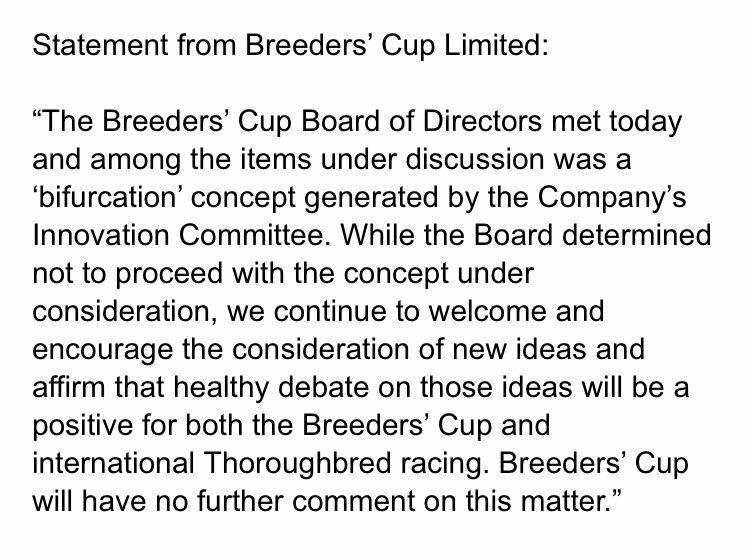 Statement just released from Breeders' Cup: "The Breeders’ Cup Board of Directors met today and among the items under discussion was a ‘bifurcation’ concept ... while the Board determined not to proceed with the concept under consideration, we continue to welcome...new ideas." Glad they came to their senses. I understand the need for innovation, but a little common sense won't hurt when considering new ideas. Eleven live programs will feature 20 qualifying races from seven tracks. The Breeders’ Cup unveiled the schedule of races that make up its 2018 “Win & You’re In” Challenge series on Wednesday. The winners of 82 races will automatically qualify for a spot in the starting gate of a corresponding Breeders’ Cup race. There are 66 Grade/Group 1 contests on the schedule, and 49 of the events will be held in North America. A quality filly over turf, Sinfonía Fantástica ran her best race on dirt to take the Gran Premio Criadores (G1) at Hipódromo Argentino de Palermo May 1. Under jockey Juan Carlos Noriega, she earned an automatic berth into the Longines Breeders' Cup Distaff (G1) with a three-length victory. The BC is shuffling the races around for their two-day meet. On Friday it will be all juveniles, while the Distaff and Dirt Mile get moved to Saturday. IIRC, they had tried making Friday a sort of all female race day, but I don't think the 'Let's put all the female racehorses on the less-important day' went over well. But Friday now is pretty ho-hum with just the juveniles, and three out of five less than compelling from a U.S. standpoint. At least they moved the F/M Turf back to its original distance, 1 3/8 mile. It has changed constantly throughout its runnings though, having been run at 1 1/8, 1 3/16, 1 1/4, 1 3/8. But everytime its been held at Churchill Downs its 1 3/8. The Turf Sprint has its distance changed all the time too. Being running at 5, 5 1/2 and about 6 1/2 furlongs. I guess they change the distance because of track layouts? BaroqueAgain1 wrote: The BC is shuffling the races around for their two-day meet. On Friday it will be all juveniles, while the Distaff and Dirt Mile get moved to Saturday. IIRC, they had tried making Friday a sort of all female race day, but I don't think the 'Let's put all the female racehorses on the less-important day' went over well. IMHO this is the best change that's been made since the BC was expanded and made into a 2-day event. I've never been a proponent of the juvenile races, so moving them to day 1 leaves room for the more established horses to get more of the limelight on the feature day. It's also great that the Distaff is back on Saturday again. As a spectator who can't just travel on a whim, I LOVE this idea. If I need to put my "expenses" for a trip in one basket and get the most bang for my buck, just going for the Saturday races makes a ton of sense. As a bettor, I can't imagine any not jumping a bit at this idea as well. I've always like the "baby" races and having fairly unpredictable results (they are mostly unraced 2YOs) and large fields should make the wagering challenging. Amen. I don't have to take off work now.